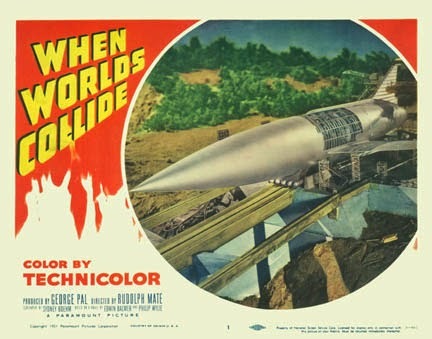 A couple of weeks ago I was browsing at the used DVD and bookstore at our local mall when I happened across a brand-new, never-opened DVD of WHEN WORLDS COLLIDE (1951). I remembered my husband mentioning in the past that he thought WHEN WORLDS COLLIDE was the kind of '50s sci-fi I'd enjoy, so I was happy to bring home a new copy for a low price! I liked WHEN WORLDS COLLIDE a great deal and am glad that bit by bit I've been overcoming my lifelong aversion to science fiction films. I'm finding that I've enjoyed the style of the '50s science fiction films I've seen very much. WHEN WORLDS COLLIDE was both entertaining and thought-provoking. Astronomer Dr. Emory Bronson (Hayden Rorke of I DREAM OF JEANNIE) discovers there are two planets heading straight toward Earth: Zyra, which will come close enough to Earth to cause major planetary disruptions including tidal waves and volcano eruptions, followed a few days later by Bellus, which will smack Earth head-on and mean the end of the world as we know it. Most people on earth initially downplay the information as a crackpot theory, but a few people including Dr. Hendron (Larry Keating) and his scientist daughter Joyce (Barbara Rush) immediately get to work on a plan for the survival of some of mankind. A spaceship is built which will take off just before Bellus strikes, with enough fuel to reach Zyra. It's not certain if Zyra will be inhabitable, but there's no other option. Eventually the ship, a modern-day Noah's Ark, is loaded with pairs of animals, microfilms of mankind's most important writings (the Bible, Shakespeare, anatomy, and math books among them), a few hand-picked scientists, a doctor (Peter Hansen), and pilots (Richard Derr and Stephen Chase), plus a group of men and women who have worked on the spaceship and are chosen by lottery. As Bellus approaches it's clear there is no joke, it really is the end of the world, and everyone else on Earth is looking for a way to escape. Between the impending collision with Bellus and the rioting population, will the ship be able to take off? And if it does, what will it find when it gets to Zyra? The screenplay by Sidney Boehm was based on a 1933 novel. The script and acting are not great, but good enough; truth to tell, if it were better I might have found the movie too intense to watch! Instead it's quite pleasing in that colorful, cartoony style which defines '50s sci-fi, while also providing quite a bit of food for thought. The film deservedly won the Oscar for Best Special Effects, while W. Howard Greene and John F. Seitz were nominated for Best Cinematography. The ship's takeoff down its ramp and out into space is truly impressive; other than the final shots of Zyra, which look like they're from an animated film, this is a great-looking movie. One of the interesting things about films of this era is that in a time when a smaller percentage of women focused on careers, science fiction movies often provided roles for women as scientists. 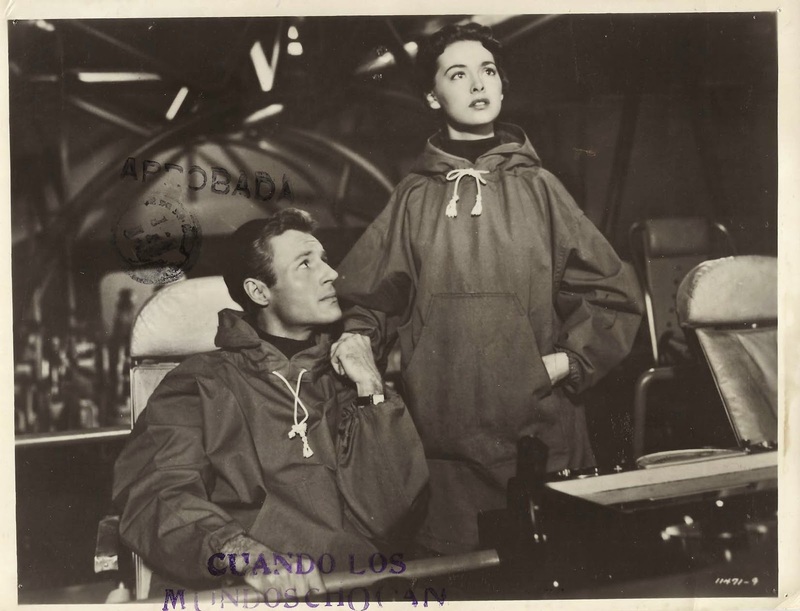 Examples include Martha Hyer in RIDERS TO THE STARS (1954), Julie Adams in CREATURE FROM THE BLACK LAGOON (1954), and Faith Domergue in IT CAME FROM BENEATH THE SEA (1955). 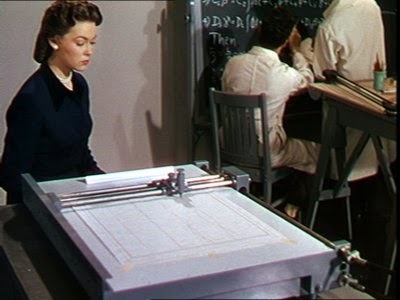 Barbara Rush plays such a character in this film, as she monitors the calculations made by the Differential Analyzer and works the numbers on her slide rule -- while dressed in smart suits by Edith Head! Rush, who also starred in the sci-fi classic IT CAME FROM OUTER SPACE (1953), is now 87. At the time she made WHEN WORLDS COLLIDE she was married to actor Jeffrey Hunter, with whom she had a son, Christopher. She later married publicist Warren Cowan; their daughter Claudia Cowan is an on-air reporter for Fox News. Viewers such as myself who watched GENERAL HOSPITAL "back in the day" will enjoy not one but two GH cast members among the stars of WHEN WORLDS COLLIDE: Peter Hansen (billed here as Hanson), who played attorney Lee Baldwin on the soap opera, and Rachel Ames (billed Judith Ames), who was GH's Audrey Hardy. Hansen plays a doctor who is part of a love triangle with Rush and Derr, while Ames plays a young woman at risk of being separated from her boyfriend by the lottery. 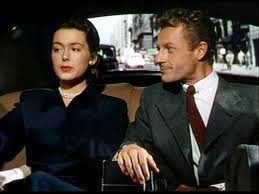 Ames was the daughter of extremely prolific character actors Byron Foulger (seen by me just last week in DUDE COWBOY) and Dorothy Adams (Gene Tierney's maid Bessie in LAURA); she's the widow of actor Barry Cahill. As of this writing both Hansen and Ames are still with us, ages 92 and 84, respectively. There are a number of other interesting faces in the movie. 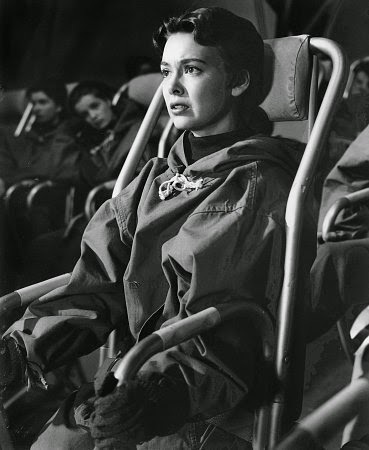 Kasey Rogers is a stewardess early in the film, the same year she played the murder victim in Hitchcock's STRANGERS ON A TRAIN (1951), where she was billed as Laura Elliott. John Ridgely, always a favorite of mine, is the Chief Customs Inspector when the plane lands. Watch for Mary Murphy as a student. Kirk Alyn, star of the '40s SUPERMAN serial, is a rioter, while Frank Cady of GREEN ACRES plays the assistant to a wealthy, arrogant industrialist (John Hoyt). The great voice artist Paul Frees is the Narrator; Frees also played a significant voice role in EARTH VS. 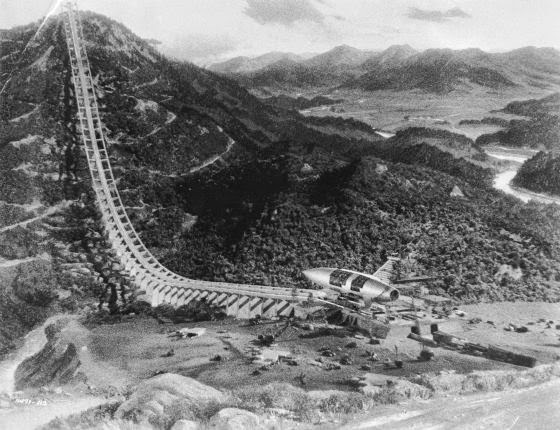 THE FLYING SAUCERS (1956). 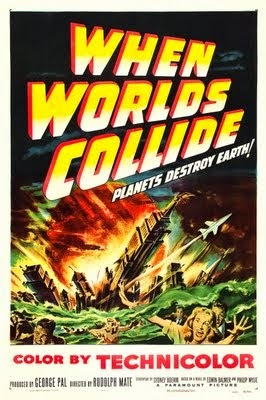 WHEN WORLDS COLLIDE was directed by former cinematographer Rudolph Mate. It was produced by George Pal and, according to IMDb, an uncredited Cecil B. DeMille. The film runs 83 minutes. In addition to the DVD, WHEN WORLDS COLLIDE can also be streamed via Amazon, where it's free for Amazon Prime viewers. The DVD can be rented from ClassicFlix. '50s sci-fi/monster films previously reviewed at Laura's Miscellaneous Musings: THE WAR OF THE WORLDS (1953), IT CAME FROM OUTER SPACE (1953), THE MAGNETIC MONSTER (1953), CREATURE FROM THE BLACK LAGOON (1954), RIDERS TO THE STARS (1954), IT CAME FROM BENEATH THE SEA (1955), EARTH VS. 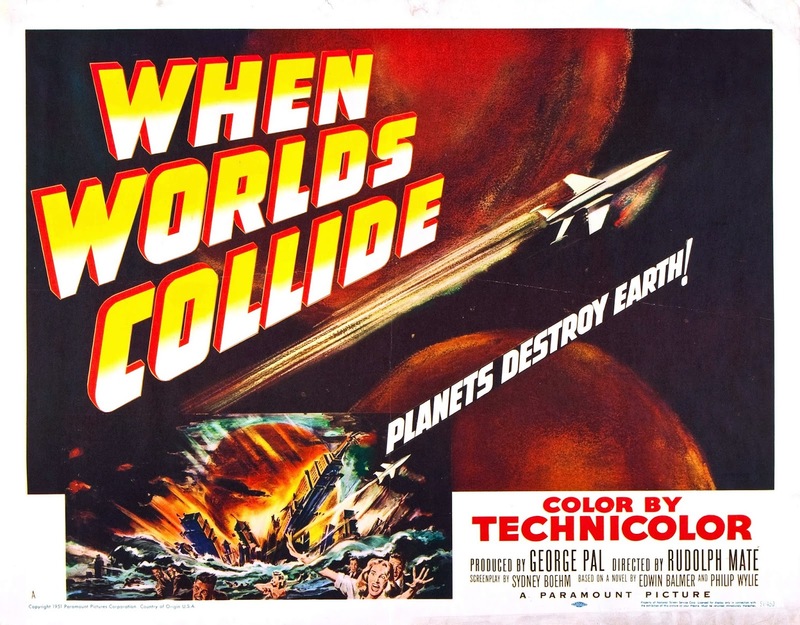 THE FLYING SAUCERS (1956), and THE NIGHT THE WORLD EXPLODED (1957).